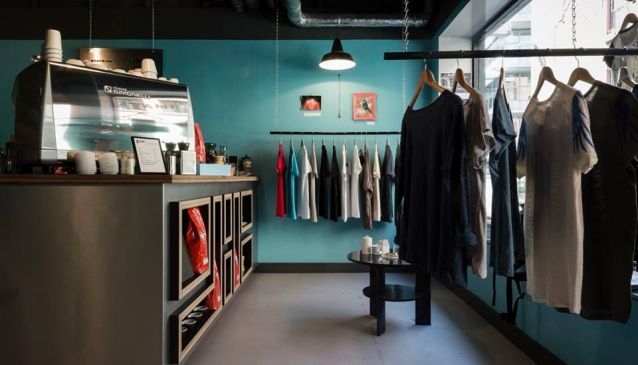 If you're used to having a cuppa in one place, and browsing through racks of clothes in another, then perhaps checking out accessories in still another, think again: Tamp & Stitch have created a new reason to hang out in the Old City area of Temple Bar. An innovative boutique café, Tamp & Stitch supply independently roasted coffee perfectly brewed by their enthusiastic baristas. With selected clothing offerings and unique jewellery line, Tamp & Stitch is where everything happens in one space! You'll also find coffee and coffee-making supplies to take home for your own caffeinated beverage experiments. And if you are a designer looking for a place to display your pieces, Tamp & Stitch want to hear from you! Is it a clothing shop? Is it a coffee place? Is it a display space? It's all of the above, and somehow it adds up to more than the sum of its parts.